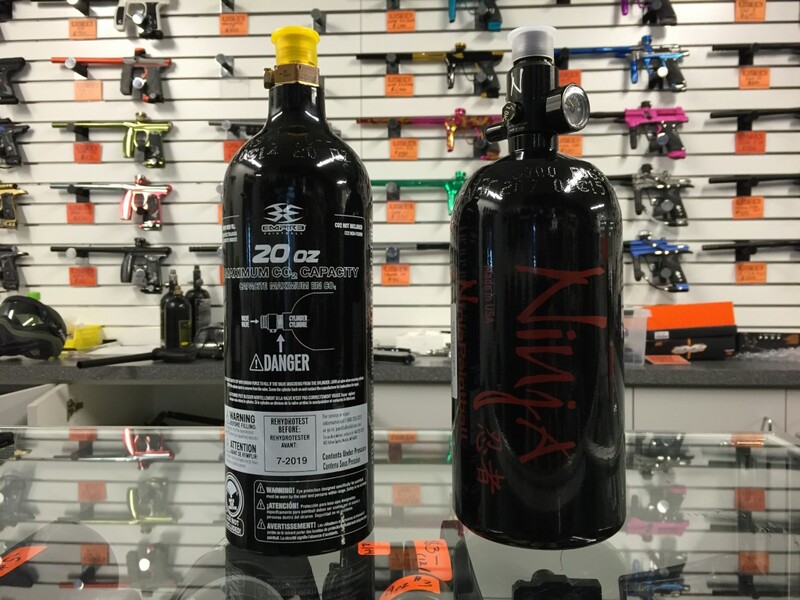 CO2 or Compressed Air for Paintball is available at Air Assault Paintball for both rent and refills. Air Assault Paintball is one of the best indoor paintball parks in Minnesota with the best prices on gear and rental packages. This indoor park is loaded with games and activities for all ages. Although the first paintball game was played over 30 years ago, paintball has become increasingly more popular over the last few years. With the growth of the sport of paintball we have added more paintball inventory to provide the best array of products for our customers. Our 30,000 sq. ft. paintball center is fully equipped with both CO2 or Compressed air fills. Our retail shop offers soda stream, CO2 and compressed air for all types of air tanks. We are capable of filling and re-hydroing tanks. Our specialists are certified to fill and handle air tanks properly and safely. Bring your tank in today to get tested or filled from any one of our technicians. Players may also purchase small CO 2 cartridges at our shop or look into buying a pre-owned tank. Air Assault refurbishes products for resale at the on-site pro-shop. Products range from as little at a few dollars to hundreds depending on the type of bottle or capable air storage. CO2 or compressed air is used for mostly paintball but also an option for soda machines and brew kits. Factor for gamers to consider when selecting tanks with co2 or compressed air for paintball is the level of skill or gear they are used to. The co2 tanks are usually preferred and perform best with beginning gamers. These tanks are more effective with nearly all low end paintball guns out on the market today. Other electronic paintball markers use a warmer air such as compressed air tanks. Both types of tanks need to be certified safe from a production date. Tanks may need re-testing and re-certification every 3 to 5 years. If tanks are out of date Air Assault will help re-certify them or help recycle the CO2 or Compressed Air for Paintball tanks. Our shop is always open during the week and all year round. We encourage players to research which tank or whether or not to use tanks with co2 or compressed air for your paintball equipment. You will find several factors that could help you pick which tank can or should be used on your equipment. The very first factor is always cost and overall, compressed air tanks are more expensive compared to co2 tanks. Good news is that we offer the best paintball prices on CO2 and Compressed air in the Twin Cities. Services at our facility also include the best paintball experience in Minnesota. Whether you are looking to get a tank filled or play paintball Air Assault Indoor Paintball is the spot for you! We can accommodate just about any size of group. Small or large there is always a time open to play. Check us out all year round! No minimums or restrictions to group sizes. Just give us a call at 651-222-0300 with any questions you may have about CO2 or Compressed Air for paintball. Check out our Facebook for more details or just stop on by at our Paintball store in St. Paul.